Now this would be a fantastic recording job…. 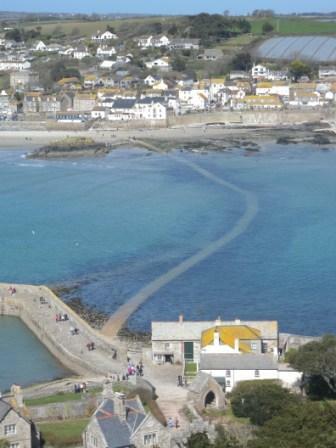 Here’s a picture of the tidal causeway linking St Michael’s Mount to the mainland settlement of Marazion, near Penzance in Cornwall. 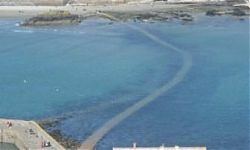 The photo was taken around an hour before low tide (we waded back across sections of it later as it was a rather ‘high’ low tide!). The island was home to a Benedictine Priory, held by the Norman abbey of Mont St Michel, until the 14th century, when it was dissolved as an ‘alien’ monastery and granted to (here’s the link to the Thames) the Abbess and Convent of Syon Abbey in Isleworth.